Energystics works with a group of graduate students at SUNY Stony Brook and their startup, Juice + to develop the Vibristor® linear electric generator technology for use in harvesting the intense vibrational energy of off road mountain bikes to power on board electronics and lighting system including the new electronic transmission systems that are now appearing on such bikes. A fully functional prototype was assembled and the technology was entered into the NYS Entrepreneur and Business Plan Challenge. 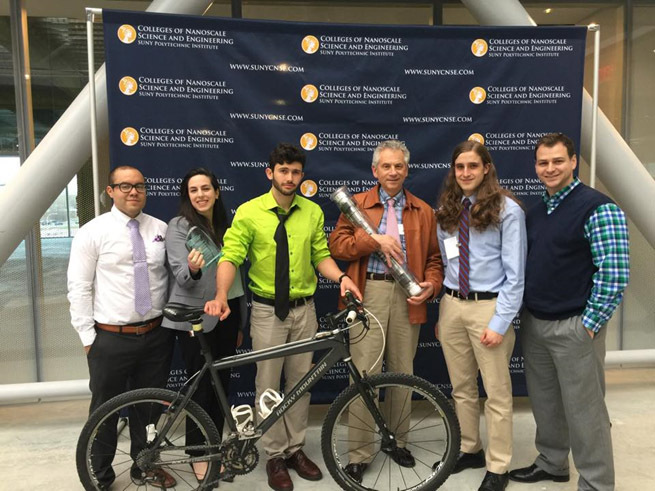 The team achieved a second prize and cash award of $10,000 in the local competition at SUNY Stony Brook, a second prize and cash award of $4,000 in the regional competition of competing schools on Long Island, NY, and on April 24, in Albany, NY, won the People’s Choice Award in the area of Energy and Green Sustainable Technology with a cash award of $500. Energystics begins a collaborative effort with the Sensor-CAT and the light engineering department division of the Department of Engineering and Applied Science of SUNY at Stony Brook to develop a computer simulation of the Compressive Repulsive Magnetic Field Technology for linear electric generator applications for ocean wave and environmental vibrational energy harvesting. Additional patents are issued for other aspects of the ocean wave energy harvesting technology developed by Energystics. Energystics has joined CEBIP, the Clean Energy Business Incubator program at SUNY at Stony Brook. First patent covering Compressive Repulsive Magnetic Field Technology (CRMFT) used for vertical linear electric generators for wave energy harvesting is issued. Energystics Ltd is formed as a startup company in the state of NY for the purpose of doing research into and commercializing technology for the purpose of harvesting ocean wave energy and energy from vibrational wave energy sources in the environment. Operations are begun at the Advanced Energy Research and Technology Center (AERTC) incubator program under the auspices of The Department of Engineering and Applied Science at SUNY Stony Brook.